The Black Keys — those two blues- and garage-loving Ohioans best known for recording raw, stripped-down, "mid-fi" albums — picked up four Grammy awards last night. English folk rockers Mumford & Sons have just unveiled a video for their new song, "I Will Wait." Watch it below. British folk rockers Mumford & Sons have officially announced Babel as the title of their upcoming sophomore effort, which is set to be released in the fall. British folk rockers Mumford & Sons have posted a cryptic trailer for their upcoming second album. Watch it below. 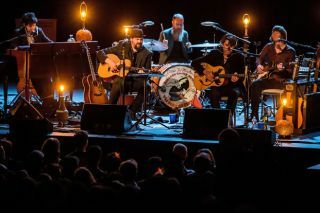 Starting August 1 in Hoboken, New Jersey, British Folk Rockers Mumford and Sons are scheduled to tour America until September 1. This will be part of their “Gentlemen of the Road” Tour of Stopovers. British folk rockers Mumford & Sons have set a tentative release date of September 24 for their long-awaited sophomore album and follow-up to 2009's Sigh No More. Video: Mumford & Sons Debut New Song, "Ghosts That We Knew"
Top of the Pops: Mumford & Sons, "The Cave"
In this three-minute video lesson, Matt Scharfglass and his Epiphone show you how to play the verse to the Mumford & Songs song "The Cave" from their 2010 album, Sigh No More. A new track by Mumford & Sons has appeared online, courtesy of a session on Colorado radio station KBCO. Jimmy Brown shows you how to play Mumford & Son's hit song "Little Lion Man."